The MAN B&W 12S90ME-C Mark 9.2 type diesel engine set the world record in October of 2014 for the largest engine ever built. 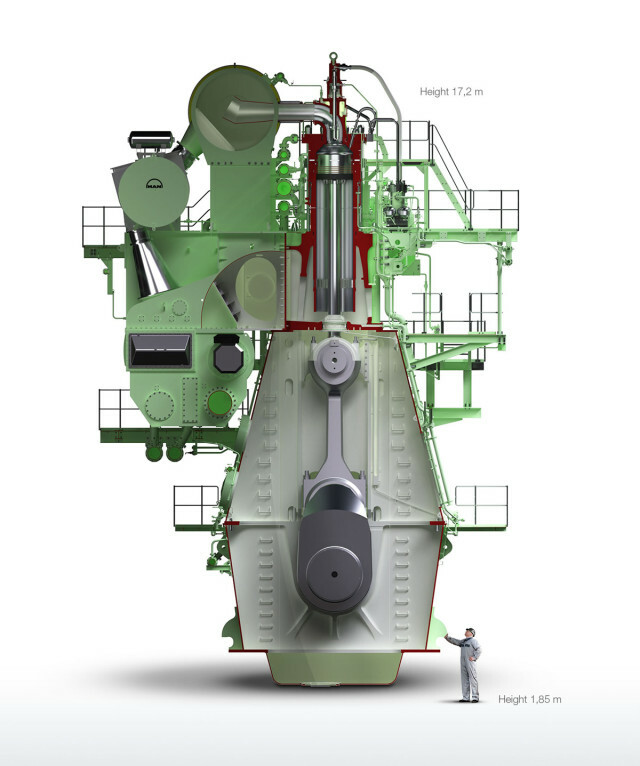 It’s not only physically the largest, but the diesel manufacturer’s low-speed two-stroke diesel engine is one of the most powerful, rated at 98,000 hp. The MAN B&W 12S90ME-C Mark 9.2 uses electronically controlled hydraulic/mechanical actuators for the fuel injec­tion and exhaust valves. It’s fuel pressure booster is a plunger powered by a hydraulic piston. An electronically controlled proportional valve sends pressurized oil to drive the hydraulic piston. Each cylinder, also, has its own hydraulically activated fuel oil pressure booster. Fuel injection is performed with a valve that is electronically controlled by the the Engine Control System (ECS). Exhaust valves are opened by a two-stage valve actuator with oil from an electronically controlled proportional valve and closed with an “air spring.” With electronic control of the valves, the valve timing is infinitely adjustable. All ME­-C engines, including the massive 12S90ME-C Mark 9.2 are dual fuel engines (CNG or diesel) using high­-pressure injection.